The Global Entrepreneurship Index (GEI) is a composite indicator of the health of the entrepreneurship ecosystem in a given country. The entrepreneurship ecosystem is the important factor here. I have written several pieces in this newspaper advocating for a vibrant entrepreneurship ecosystem in Sierra Leone. “Entrepreneurship is the answer to the vexing economic questions facing Africa today: job creation, capital formation, skills acquisition, taxation-based self-sufficiency, quality of governance-demand, and of course social inclusion”. (HBR Blog. 1:03 PM March 5, 2012). In order for entrepreneurship and innovation to play the crucial in creating jobs and growing our economy, we need to develop value creating and high growth entrepreneurs. HOWEVER, without an Entrepreneurship Ecosystem that supports value creating and high growth entrepreneurs, this promise we will not be fulfilled. The Global Entrepreneurship Index measures 14 components in an entrepreneurship ecosystem. That we are 5th from bottom is not a surprise, since we have a weak to non-existent entrepreneurship ecosystem. The GEI measures both the quality of entrepreneurship and the extent and depth of the supporting entrepreneurial ecosystem. I will take you through all 14 of the components and what they measure. Can the population identify opportunities to start a business and does the institutional environment make it possible to act on those opportunities? Does the population have the skills necessary to start a business based on their own perceptions and the availability of tertiary education? Are individuals willing to take the risk of starting a business? Is the environment relatively low risk or do unstable institutions add additional risk to starting a business? Do entrepreneurs know each other and how geographically concentrated are their networks? How does the country view entrepreneurship? Is it easy to choose entrepreneurship or does corruption make entrepreneurship difficult relative to other career paths? Are entrepreneurs motivated by opportunity rather than necessity and does governance make the choice to be an entrepreneur easy? Are entrepreneurs highly educated, well trained in business and able to move freely in the labor market? Are entrepreneurs creating unique products and services and able to enter the market with them? Do businesses use new technology and are they able access high quality human capital in STEM fields? Do businesses intend to grow and have the strategic capacity to achieve this growth? Do entrepreneurs want to enter global markets and is the economy complex enough to produce ideas that are valuable globally? Is capital available from both individual and institutional investors? Sierra Leone global rank is 132/137. Our strongest area is Product Innovation and our Weakest area is Start-up skills. Overall GEI score is 12%.On the individual score, Sierra Leone scored 57% on entrepreneurial qualities of the people in the ecosystem. 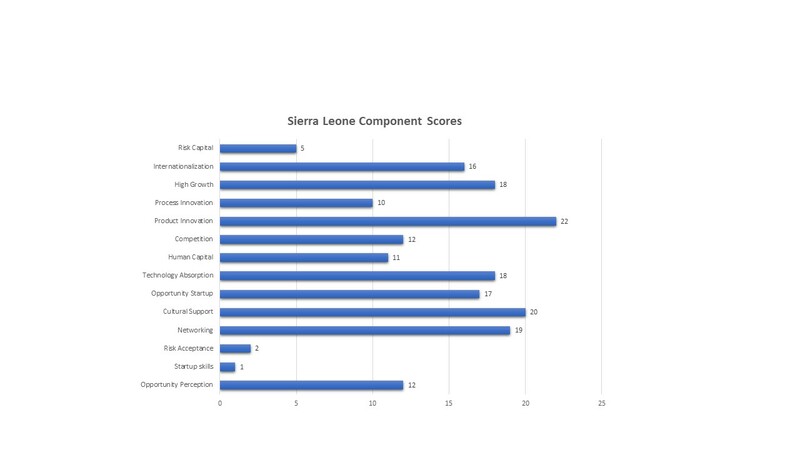 To underscore my previous articles on ecosystem, Sierra Leone scored only 25% on the quality of institutions that support entrepreneurship. Botswana, for example, scored 48% on institutional support. There is a strong correlation between a high score on quality of institutions, the job creation and economic growth through entrepreneurship activities. Sierra Leone compares to Botswana at 34.9- the leader in sub-Sahara Africa. The bottom country in sub-Sahara Africa is Chad with a score of 9.0. United States, Switzerland, Canada, UK and Australia are the top 5 with 83.6,80.4,79.2,77.8 and 75.5 respectively. Sub-Saharan Africa’s greatest strength is in the area of Opportunity Perception. Entrepreneurs in the region are able to spot opportunities around them for starting businesses. The region’s lowest average scores are in the areas of Start-up Skills, Risk Acceptance and Risk Capital. Tertiary education is not as broadly accessible as in other regions, and entrepreneurial skills are less common. The general risk climate is not as favourable in the region as in other areas, and the capital availability lags behind other regions. There is significant opportunity for improvement, however, as Sub-Saharan Africa can look to the examples of regional leaders Botswana and South Africa. Both countries demonstrate the possibility for great change and substantial improvement on relatively short time scales. Further, the region has a few clear bottlenecks which, if addressed, could quickly yield overall improvements in entrepreneurial ecosystems and the economy as a whole. Globally, for 2018 the most significant improvement over 2017 is we’ve seen a 22% increase in Product Innovation scores since the 2017 GEI, and an 11% increase in Start-up Skills scores since the 2017 GEI. This suggests that the global population is becoming more educated and identifying more opportunities to create new products. The Asia-Pacific region shows greatest strength in Human Capital and Product Innovation – on average, countries in the Asia-Pacific region have highly educated populations that are well trained in business and able to move freely in the labor market. They are also producing products that are new to customers and integrating new technology. European nations post high average scores on Start-up Skills, owing to a legacy of broadly available tertiary education and a populace that largely possesses the skills necessary to start a business. The region’s biggest weakness is in Networking, though it still scores above the global average in this area. Overall, Europe’s scores are relatively balanced across all components of the GEI, suggesting that a broader mix of policy is likely to have a larger impact on overall performance than focusing on single policy area might. The MENA region shows greatest strength in the areas of Product Innovation and Risk Capital. The region is bringing new products to market and integrating new technology, while also providing the capital to help businesses grow. The region’s lowest average scores are in the areas of Competition and Risk Acceptance, as large firms dominate many economies in the region and businesses face higher risks in many MENA countries than in other areas. The US and Canada drive most high average regional scores for North America, while Mexico contributes top scores in the area of Networking. The region’s overall greatest strengths are in Opportunity Perception and Product Innovation – the region’s population is able to spot and act on good opportunities for starting a business, and is able to bring new products to market and integrate new technology. The region struggles most in the area of High Growth – an indication that entrepreneurs in North America are not as motivated to grow and scale their businesses as their other component scores would suggest. The South/Central America and the Caribbean region scores highest on average on Startup Skills and Product Innovation. Entrepreneurs benefit from broadly available tertiary education and a high levels of business skill. They are also creating products that are new to markets and integrating new technology into their businesses. 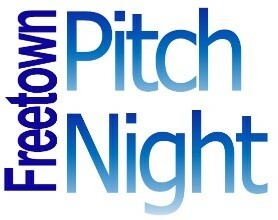 In my next piece, I will discuss what can be done to improve the components of the entrepreneurship ecosystem.